Android marketplace is growing and one of the biggest threat to Android smartphone is it’s prone to hacking. One of the simplest way you can make sure your Android Smartphone is safe by installing one of the best Antivirus app on your Android smartphone or tablets. If you have not done it yet, I suggest you to install one right away. The best protection starts when you have any one of these android anti-virus app installed on your device from day 1. Securing your personal data from intruders has always been the top most priority. But one device which has the most information about you is your very own Droid. Securing it, can itself be a tough task. Considering the popularity and the usage of Android, the target of hackers is shifting from computers to Android powered Smartphones. We do all of our daily tasks like transaction of money, recharging our mobile, reading & editing official documents etc. from our Android, so securing it is very essential. But you don’t have to fear! 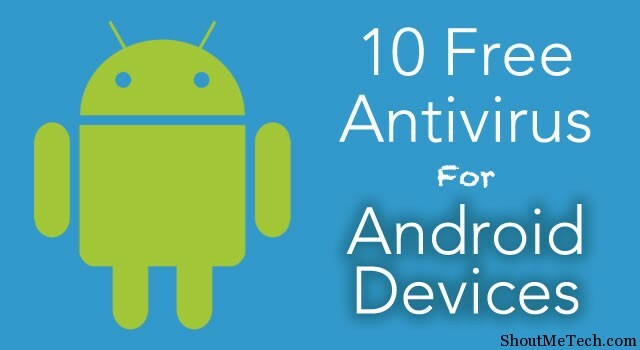 Here, I have drafted a list of Top Free Antivirus for Android devices which would ensure your device remains protected all time long and you feel relaxed about all the transactions done from your phone plus you’ll feel relaxed that your personal data always remain protected. Everyone has heard of AVG! Right? AVG is one company which provide antivirus, anti-malware and anti-phishing software for Computers and now Androids too. The app comes in two flavours, one being the free version and other being the pro version. The anti-theft feature of the app is a really good feature provided in both free and pro version of the app. Another antivirus software company’s name, which is well-recognized by Computer users. Good news is, they now provide security for Android too. There are many flavours of BitDefender app, but I’ve used Bitdefender Antivirus Free. It really offers 360 protection for your device with features like Memory Booster, Cache Cleaner, anti-theft, phone cleaner, SMS and call blocker and much more. Extremely light antivirus app for androids which includes comparatively smaller signature updates and is very beneficial for those who always struggle with limited data plans. Along with all this, it offers full scan, quick scan and custom scan to scan specific files user wants to scan. The free version of Kaspersky comes with very basic features which includes essential anti-virus protection features. However, the paid version offers features such as anti-phishing and cloud protection which is definitely a win. Along with security features like anti-virus, anti-malware & some restricted features of backup and anti-theft; this app offers a tremendously useful feature, which is saving the last location of droid when battery is critically low. You need to register an account for using the app. Norton is a name in field of antivirus security which requires no introduction. I’ve found that the free version of the app provides pretty basics feature like removing malware and viruses, which slows down the device. Another good feature in free version is remotely locking phone via SMS. One only gets 30 days free access to the app. Very standard and simplistic app, which presents basic anti-virus, anti-malware features along with secure web browsing and some data backup features. It is not very well known, but because of it’s simplicity, many people like it. Another well known name in security world. It provides a variety of features like privacy report, network meter, firewall, secure web browsing, app locking, backup along with SMS and call filters. Now, take my words for this. This is the ‘best app’ out there providing you with an absolutely free package of rich features; many of which are paid in other apps. This is highly popular app and possess a very good rating too. Along with basic features for anti-virus, anti-malware, this app comes with anti-theft feature which can be integrated with Google Maps, scream mode etc. I hope these Antivirus android apps would help you in ensuring good security for your phones and always keeps you relaxed about any illegal access to your personal information. If you are using any other app which is working out the best for you, let me know via comments. Don’t forget to share this article with your family and friends who are using Android devices, as their security is your responsibility too. Sanyam has written 6 articles.